CD1: I Found A New Baby; Once In A While; You're A Sweetheart; Sweet Sue; Epistrophy; 52nd Street Theme; Oop-Bop-Sh'Bam; Rue Chaptal (Royal Roost); Confirmation; A La Colette (Cheryl); Jumpin' There (Listen Here); Jay Mac; Algerian Cynicism; Laurenzology; Doria; I'll Tell You In A Minute; Working Eyes; Stuffy; The Man I Love; I Surrender Dear; Love In The Sun; Iambic Pentameter; Assy Panassy; Robbins' Nest; I'll Get You Let; Be Good, Girl. CD2: Sonor; Strollin'; Blues Mood; Skoot; Klook's Nook; Inhibitions; Baggin' The Blues; Telefunken Blues; Summer Evening; Oz The Wizzard; I Dig You The Most; Pru's Blooze; Plenty For Kenny; Cute Tomato; Now's The Time. CD3: With Apologies To Oscar; Hear Me Talkin' To Ya; Willow Weep For Me; Bohemia After Dark; Chasm; Late Entry; Will Wail; Volcano; La Poria Thority; I Hear A Rhapsody; Yesterdays; Play, Fiddle, Play. CD4: Cottontail; Your Host; Tricotism; Tom's Thumb; You Turned The Tables On Me; Afternoon In Paris; Apothegm; 'Round Midnight; On A Riff; When Lights Are Low; Oblique; Jeru; Eronel; Tahiti; Bemsha Swing; Blue Serge; Swing Spring; The Squirrel; Cadenze. Kenny Clarke: drums. CD1: Clarke's Kvintett (1-4); Kenny Clarke & His 52nd Street Boys (5-8); Kenny Clarke Sextet (9-12); Kenny Clarke Orchestra (13-16); Michel De Villers Et Son Orchestre (17-20); Hubert Fol Et Ses Be-Bop Minstrels (21-24); Kenny Clarke & His Orchestra (25,26). 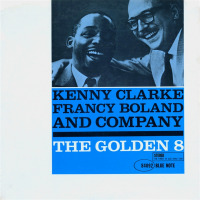 CD2: Kenny Clarke All Stars (1-4); Telefunken Blues (5-8); Kenny Clarke/Ernie Wilkins Septet (9-15). CD3: Kenny Clarke Septet (1-6); Klook's Klique (7-12). CD4: Kenny Clarke Meets The Detroit Jazzmen (1-7); Kenny Clarke's Sextet (8-10); Kenny Clarke & His Sextet (11-19).